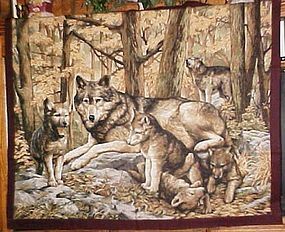 Ready to hang fabric wolf family wall hanging complete with backing and finished with rod pocket so you can add any style hanger or curtain rod and enjoy in your favorite room. Measures 43" wide by 35" tall. These could be easily converted to use as baby quilts or small throws for children or stuff them and make them into large floor pillows. My mother had a lot of these made up and now she is getting up in years and has to quit sewing. We will be listing a lot of these neat things, Some finished and some unfinished. Check ot the site to see what I will be adding for her.